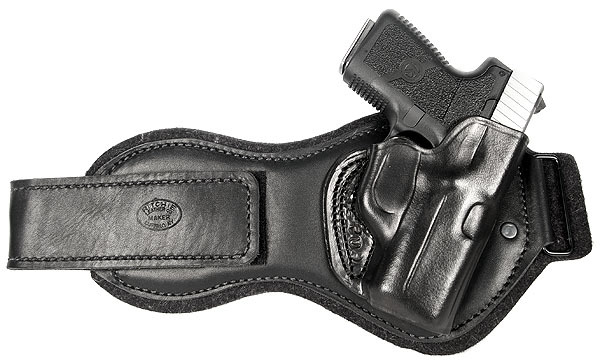 A secure and comfortable ankle rig, the Ritchie Leather Sig P238 Ankle Holster features a 1/2 inch thick felt pad and a 2 inch velcro strap. Designed for comfort, durability and a positive fit, this ankle holster can be used for your back-up gun or your everyday carry weapon. Right Hand. This is basically an Alessi, it fits perfect and is snug. Comfortable. Great ankle rig! For a Sig P238 there was basically no break in time. It worked great right out of the bag other than needing to trim the felt a little to get a tight fit. I don't even notice it's there. Very comfortable. I have 100% confidence in the holster. Really no complaints at all after slight fitting to my ankle.